I work on a computer all day, and am getting up in years, so easing eyestrain is important to me. 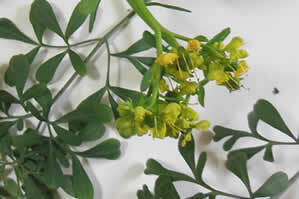 Rue has an ancient reputation as an herb healing to eyes, and modern science confirms that the flavonoid rutin indeed strengthens the small capillaries that improve circulation to the eyes and heart. Recipe Instructions: Poultice :Put a generous handful or so of fresh leaves, or a few tablespoons of dried into a muslin bag. Pour enough hot water over the bag to thoroughly wet it and let cool for 10 to 15 minutes until comfortably warm. Close your eyes, lean back and apply the moist compress to your eyelids . The musky odor of the infused rue leaves is very relaxing.